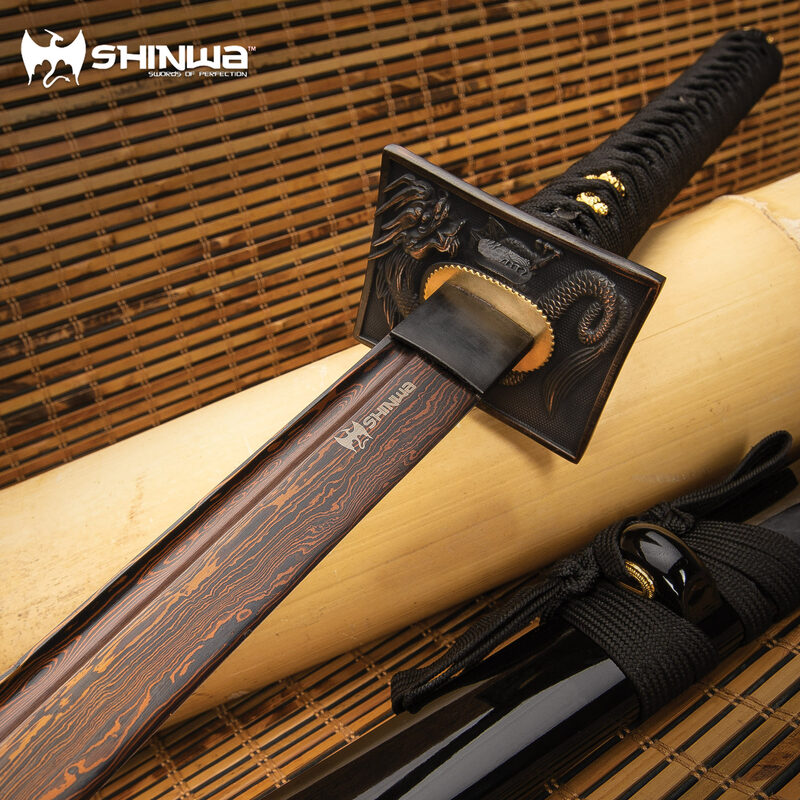 Shadowy and mysterious, yet clearly capable, Shinwa’s “Black Knight” Katana embodies the fabled “dark-“ or “black knight” of lore – a rogue warrior loyal to no warlord or king, who fights only for himself and his own cryptic, deviant-yet-noble principles. 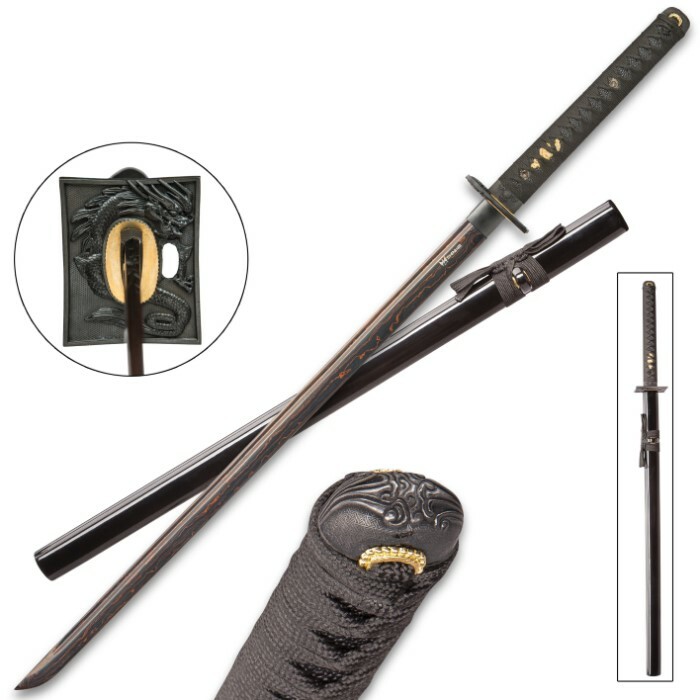 Indeed, the Black Knight Katana slashes to the beat of its own drum. 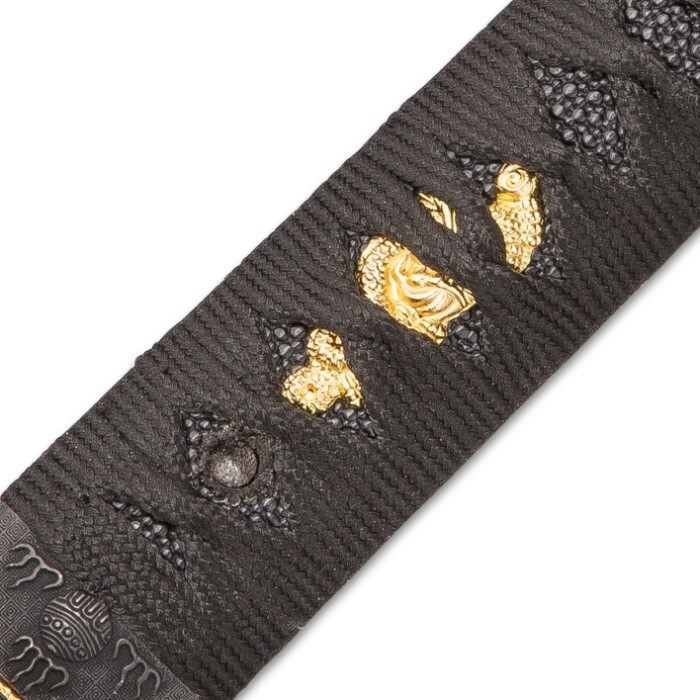 And despite its grim hues, the Black Knight is nothing if not vibrant and alluring; it’s teeming with distinctive appointments and captivating accents – a true masterwork of contemporary sword design. 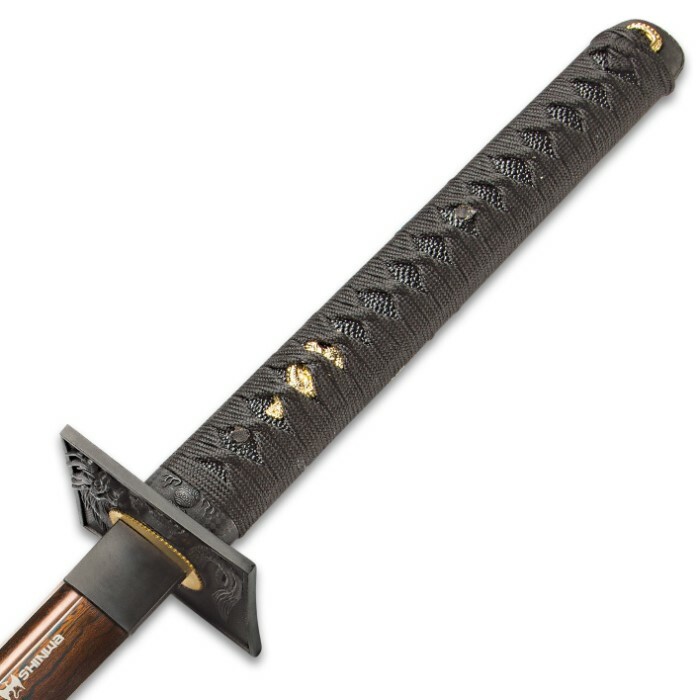 But behind this stylishly unsettling façade lurks a downright frightening beast – a formidable tanto blade hand forged from black Damascus steel. 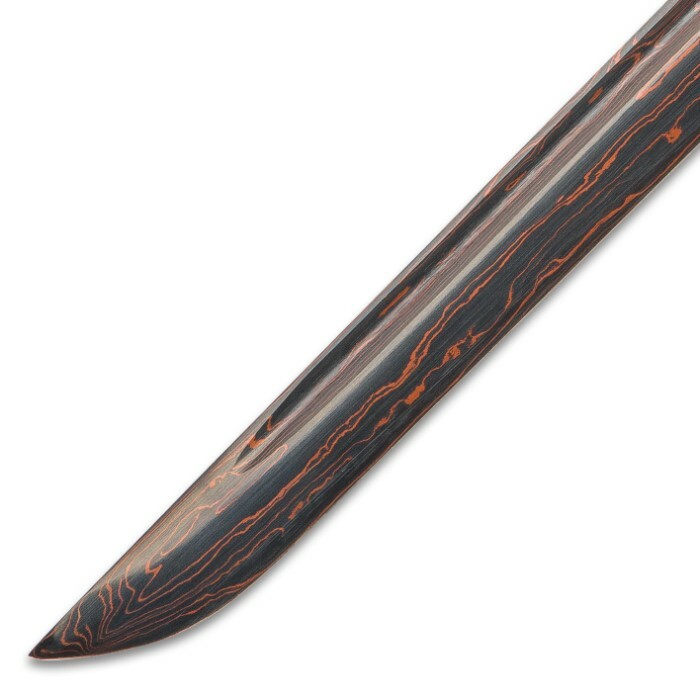 The Black Knight’s distinctive black Damascus steel is a tumultuous sea of contrasting lines, waves, swirls and other mesmerizing patterns, all cloaked in a shadowy dark hue. 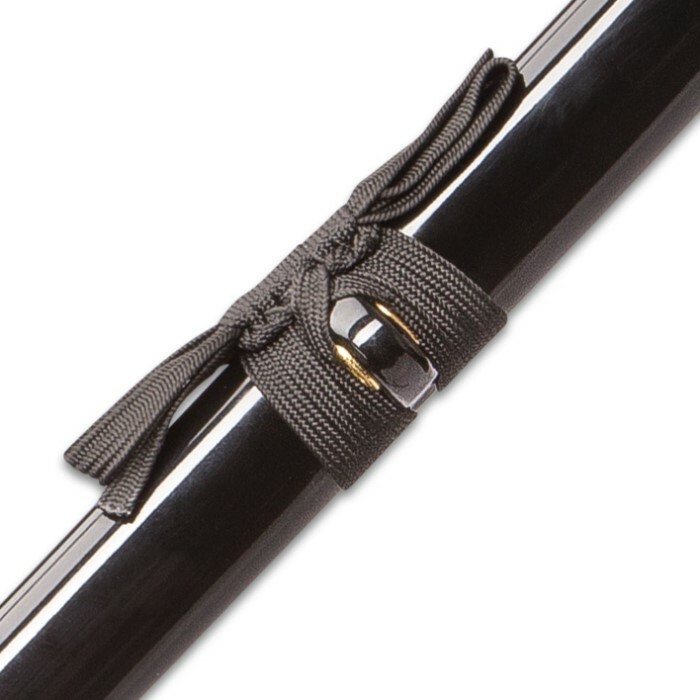 Each line is a distinct variety of steel, hammer welded and hand folded repeatedly to yield the thousands of layers in each Black Knight blade. The unique metalsmithing technique’s roots stretch back to the Middle Ages, and today it’s still painstakingly performed by seasoned hands – no automation, no mechanization. 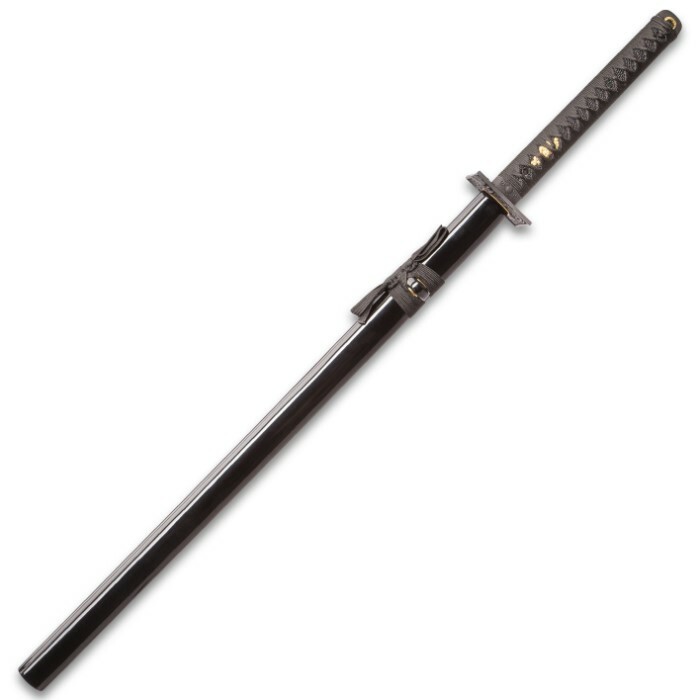 To make each Black Knight blade, a Shinwa master swordsmith fires a stack of steel blanks - each piece a different alloy - in a white-hot forge until the metal glows red hot. He then removes the stack and hammers it until it’s around half as thick as the original. Then he folds the metal onto itself lengthwise and hammers each half together. The process is meticulously repeated – hundreds of times in some cases – until the desired layering effect is achieved, at which point a final quenching strengthens the resulting blade, while an acid treatment highlights vivid contrasts in the layers. And the slow, laborious process itself it just the beginning!